The George H.W. Bush Carrier Strike Group is set to depart on Saturday for a European and Middle East deployment from Naval Station Norfolk, Va. and Naval Station Mayport, Fla., the Navy announced on Thursday. The strike group is set to continue carrier based strike against Islamic State forces in Syria and Iraq during its deployment to the U.S. 5th and 6th fleets. The 6,000 member CSG will embark on carrier USS George H.W. Bush (CVN-77), guided missile destroyers USS Laboon (DDG-58), USS Truxtun (DDG-103), guided missile cruisers USS Philippine Sea (CG-58) and USS Hue City (CG-66). The strike group is also set to deploy with Carrier Air Wing 8, which includes Strike Fighter Squadron (VFA) 213 “Fighting Black Lions”; VFA-31 “Tomcatters”; VFA-87 “Golden Warriors”; VFA-37 “Ragin Bulls”; Electronic Attack Squadron (VAQ) 131 “Lancers”; Early Warning Squadron (VAW) 124 “Bear Aces”; Helicopter Mine Countermeasure Squadron (HSM) 70 “Spartans”; Helicopter Sea Combat Squadron (HSC) 9 “Tridents”; and a detachment from Fleet Logistics Support Squadron (VRC) 40 “Rawhides”. 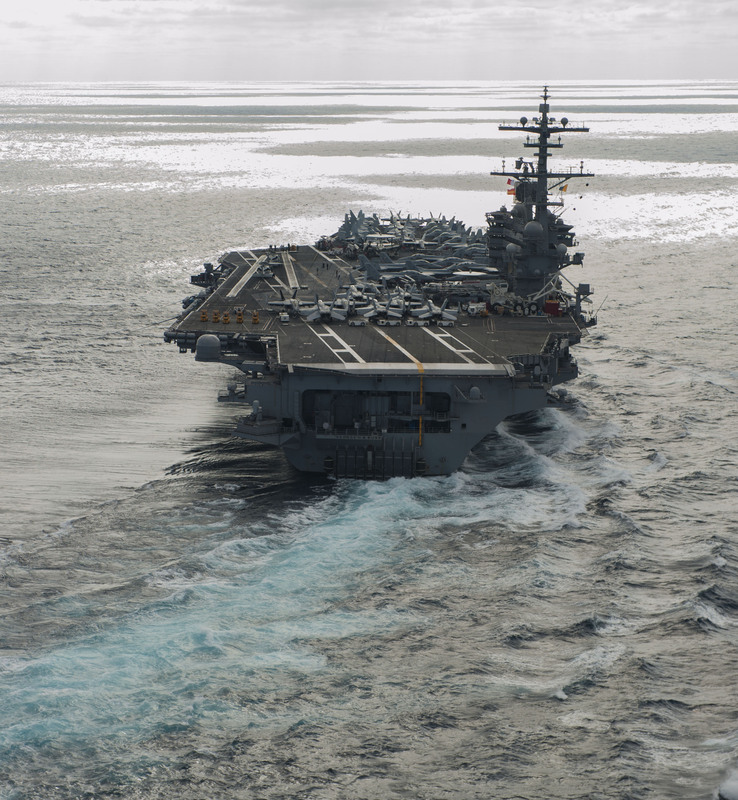 The Bush CSG deployment follows the return of the Eisenhower strike group in late December from an extended deployment in 5th and 6th fleet and a longer than expected maintenance availability for carrier Bush. The result was an extension for Eisenhower and gap in U.S. carrier presence in teh region, Naval Sea Systems Command, commander Vice Adm. Tom Moore said last week. “[Bush] was in for an eight month availability and it ended up taking us 13. And that five months, the net result was [Eisenhower] stayed on station a little bit longer,” Moore said. USNI News staff writer Megan Eckstein contributed to this report. The following is the complete Jan. 19, 2017 statement from U.S. Fleet Forces. NORFOLK, Va. (NNS) — Nearly 6,000 Sailors attached to the George H.W. Bush Carrier Strike Group (GHWBCSG) will depart Norfolk and Mayport, Florida, Jan. 21, for a regularly-scheduled deployment. The squadrons of CVW-8 will depart bases including Naval Air Station (NAS) Oceana, NAS Whidbey Island, NAS Jacksonville, NAS Lemoore and Naval Station Norfolk. CVW-8 includes Strike Fighter Squadron (VFA) 213 “Fighting Black Lions”; VFA-31 “Tomcatters”; VFA-87 “Golden Warriors”; VFA-37 “Ragin Bulls”; Electronic Attack Squadron (VAQ) 131 “Lancers”; Early Warning Squadron (VAW) 124 “Bear Aces”; Helicopter Mine Countermeasure Squadron (HSM) 70 “Spartans”; Helicopter Sea Combat Squadron (HSC) 9 “Tridents”; and a detachment from Fleet Logistics Support Squadron (VRC) 40 “Rawhides”. The deployment is part of a regular rotation of forces to support maritime security operations, provide crisis response capability, increase theater security cooperation and forward naval presence in the 5th and 6th Fleet areas of operation.